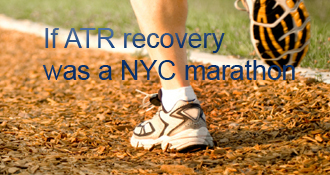 chris89 has completed the grueling 26.2 ATR miles to full recovery! Wall Push UP, Stretch for the calf, but I felt it in my tendon? I have this weird sensation no pain, but when I extend my leg and dorsFlexion and turn my foot it feels like a bubbling sensation and bubbles releasing in my Achilles tendon . It kinda feels like when a stomach gurgles from being hungry if I can explain the sensation. Anyone familiar with this. My good foot doesn’t do this. I have been attending therapy again and travelings no crutches walking to the bus doing nearly 2 hour surgery and going back home via bus. All fine and dandy, I mean my walking speed has increased from 1mph to 1.5 I can walk quicker, but I am holding myself back because the only other time I walked quicker I almost tripped. So long story short. I was doing a 6 inch incline at 1.5 for 10 minutes and was speaking with my therapist they said I should be able to walk up and down steps without the handrail. I ask if they are sure they agree, fine I walk off the bus step injured leg first no handrail and then good foot. Instantly I feel what feels like a cramp and burning sensation the cramp persist for about another 5 seconds, but there is also a burning sensation. The kind I felt the first week of walking more than 3 blocks ( I am up to 18 blocks right now, and I don’t feel the burning). Anybody have experience with this, would the burning mean a tear or poor blood flow or body adjusting to a new sensation? I also felt the burn and cramp 3 days prior when walking up a steep street corner had my injured foot planted and used it to propel my good foot up. Anybody with experience lend some. It may also be because I only do a calf stretch once a day. I can flex my calf myself and I use that as a sign of if there is damage, but does that even matter? Worried and cautious as usual and willing to listen to any and all advice. Worse fear that it is a heavy tear or dvt. Yet not tender to the touch. I went to physical therapy just yesterday, and I was getting a massage done to my leg. In the curtain next to me I hear a little girl and her mother talking about walking. The little girl cries and says “Mommy I forgot how to walk” my heart seized up a little. I felt this pain to. I asked the therapist if I could talk with the mother, I do and I find out the little girl has the same injury she is only 8 weeks stage similar protocol she has to begin walking and she has crutches still. I show the girl my scar going up my leg and tell her I have the same thing and I wasn’t able to walk, but here I am. I try my best to walk limp free and I succeed the girl says how. And I go practice and therapy. The little girl hit the nail on the head, at least in my case I forgot how to talk still kind of do unless I am watching my feet making sure I don’t get lazy and make sure I do proper heel to toe. I know I get paranoid and yesterday was the first time I walked to the bus stop waited 15 plus minutes for the bus went to therapy, limped out and took the bus back home. This was a challenge, but I did it and I am slightly better from it. Practice my therapy techniques 3 times a day. I have Same rom as my good foot and I as of today have almost regained a natural walk meaning twice the speed. Core muscles really make the difference. I may be behind on account of the time I had accidents, but I feel a little more confident I can do this. I just need one level of paranoia to go away about my good foot. When I step off it my calf muscle cramps a bit and my achilles on that side twinges when I do a heavy step off it. I want to chalk it up to my heavy use of it walking the past 2 weeks. But I feel confident that I am on the right track and I feel by November I will be just right for my 2 week trip in Florida to visit family. Swelling and blood comes to my feet at around 2 hours and 30 mins of having my foot down. I elevate for about a 2-3 minutes and my swelling goes away. I am pleased with that because by the time I board the plane I could easily sit down for the 2 hour 15-40 minute flight. So I am looking forward to it. I just hope by then I can get a seat on the train from the plane to bag pick up. That train goes to fast to not be sitting. Hope all is well with everyone and I hope my paranoia does not ruin my recovery any further then I let it have. I was practicing different wall stretches for my calf muscle and to release the tension in my tendon when I dorsiflexion. So I do a wall push up by standing feet directly beneath me at least 2 feet from the wall and I push forward and bend my knees and I feel the calf stretch, but I feel the bottom of my foot stretch also, and nowhere have I read about this particular stretch doing anything for the tendon. But it def feels looser and that also worries me since it was like a tiny tearing sensation when I went forward and the foot stretched. After the stretch I walk a little quicker, just tested by a walk around the block, but I am cautious because this site has too many stories of re-rupture and still maintaining function. Now I pose this question to the community anybody have any experience with this particular stretch and feel like doing it to share the sensation. I might be the only one who gets paranoid about these things. I had problems waking up, my foot would hurt when I flexed my foot up dorsiflexion, but I went up against a wall and pushed my injured foot back stretching the tendon. Now all of a sudden my foot no longer hurts or aches when I dorsiflexion. Has this happened to anyone else? At this point I don’t think that I injured it, because I had the scare many times over. But I always felt pain and tightness when I lifted my foot to dorsiflexion, and to just have the pain disappear when I do this. Is the wall stretch the miracle I have been looking for. My mother say it may be pinched nerves that were relieved by the stretch, but I am waiting to hear if anyone else was having pain until they did a wall stretch with the injured leg in the back. Picture below for reference. If this is the answer to my walking problems since that tightness usually stops me from making a longer stride, but not having that pain makes me feel a little over confident. Just someone let me know I am not on the wrong path. There seems to be no issue with the gap that I felt, since my foot moved during the Thompson test. Plantarflexion movement was good still. I think yesterday was a combination of never hearing my left foot crack and reading every re rupture story and seeing that minor things can cause a re rupture and you wouldn’t even know it. Side note my right foot cracks all the time. Maybe scar tissue came off, or my foot may have fell asleep from not moving it and laying down for a while. I completed an entire 1 hour 30 minute therapy session. Pt said if I had ruptured there would have been pain and swelling to list a few I had neither.My overactive mind let me think that I may have re ruptured, but thankfully I did not. I think another problem was the pt I was doing was 90 degree squats at pt and at home and I was told I should’t be doing 90 degree squats, and to strengthen my core to help further improve my gait. So false alarm everyone. It doesn’t help that the thought of re rupture passes through my mind most of the day and I have a lot riding on recovery. But I am young and I will pull through. Thanks for all who wished me well yesterday. I spent almost 3 weeks out of physical therapy, due to a family member passing. I had worried that I was regressing back due to 3 mishaps that occurred within this time. 1. going up steps and landing my bad foot on a higher step, 2. Using high resistance on stationary bike and pushing with the toes versus the heel, 3. stepping into the bathtub like normal versus the normal cripple way. Each problem caused pain in my foot and I neglected each exercise physical therapy had taught me to do twice a day. I would elevate and ice, but my leg was regressing, the therapist said I should be able to do a one legged stand for 15 seconds, right now I can only hold for 4 seconds. So I was chewed out by the pt. Now something she said that was skeptical to me that I need to ask the people on this blog about, is when you flex your foot down do you sometimes feel pain in the tendon, this occurs only after physical activity, but goes away when I sit down and flex my foot, my pt said this is natural since the tendon is very thick and not flexible and that isn’t a sign of a injury. Plus I have been having a little tightness on the left side of my ankle, pt says this again is because I am not walking properly due to the strength not being present in parts of my leg that I have not exercised at home. So does anybody have that sore stiff feeling after doing an activity and the pain goes away quickly? Thanks for all those that read and reply. I will begin to do my home workouts twice a day and my pt twice a week from here on out. After much begging and pleading my family gave up a stationary bike nobody has used in more than 4 years. I began peddling with a little resistance for around 10 minutes. I get off and my foot feels stiff and sore around the Achilles tendon to just right above the back of the heel when I flex my foot dorsi or planatar my foot feels a bit painful to move, but after I move my foot up and down for around a minute the pain and stiffness disperses .Will the pain and stiffness not even be there if I condition myself? Or is the temporary pain and stiffness a sign that I am doing too much? Could this also be a sign that I have damaged the tendon, mind you when I take a ten minute walk my foot can flex and not be sore or stiff, just happens when I ride the bike. Any advice would be much appreciated. I haven’t attended pt for 2 weeks, and have been practicing everything I learned there at home. So far my limp is almost gone, but all I do is practice how to walk. I am curious how long before you can walk up steps? And how does one build up the strength to walk up steps normally? I can probably walk up and down steps with the handrail but I want to be sure I could do it without it before I try. I don’t know if I am going too quick or too slow on my recovery, but after the recent scare I had I am just trying to make sure I do everything right to not re-rupture. I am crossing my fingers that I can return to normalcy. Best of luck to everyone. Update. The method for strong foot up and weak foot down worked like a charm. To not use crutches or look weird going up and down steps is a blessing. Was able to buy milk from the corner store. Simple ankle flexes come in 2 directions. Dorsi… means toes up, closer to your face. Plantar… means toes down, away from your face. Dorsi stretches your calf and AT, flexing the calf pulls on the AT to make Plantar (though some smaller muscles and tendons can do it without load in an ATR. Google knows lots of things, faster than us. oh man do i have strange sensasions . like really weird sht goin down. if you could please what is dorkiflexsion? Let us know how you get on. Stay positive. So many little pains n sensations to get used to along the way that come and go. Well I have been reading up on it. It doesn’t stay only comes after I walk over a mile. And read that it may be a blood clot. But I don’t have the bruising or swelling or pain. The only thing that matches is that I can’t walk as far as I had been previously walked around 2 miles, but cut back to half that since pain the the bottom of my feet. My surgeon last time I saw him said everything is healing right and dismissed me. I get more info out of my physical therapist. Which sad as it seems I will have to do this Thursday and then maybe get another foot specialist. Surgeon irrigated with Club Soda?? I got nothing. Walking up and down real stairs is one thing, but some big “steps” - like getting off a bus - can be extra tall. Not a big deal for a sound body, but an injured leg is different. You should be able to discuss this with somebody on the phone, like a nurse/practitioner in your OS’s office, or your GP. There’s probably a third category that contribute to Healing Long or other chronic problems whose causes are poorly understood. If you haven’t learned my trick for going down stairs quickly and safely, check it out, on my blog and a dozen or 2 other places. Good for leaving buses, too! I have an appointment october 7th. Yeah I have stopped trying to walk up the steps or down them. Want to go to the emergency room, but I don’t have persistent pain or anything. Just paying too much attention to my legs in a long time. No magic insight here, but (1) if it hurts when you do X, don’t do X, and (2) if something worries you and we don’t have a simple answer here, ask your Doc. You’re not alone feeling paranoid, we all get that at this point I think.. Sound advice from ‘the man’ I think. Good luck n keep going. David You are the man. I worried when I felt a tearing feeling since I felt it on the good leg as the bad leg. I went slow and once I got up movement was way better. I had heel on the floor body slanted and slowly bent my knees. I Never had My pt do any stretch that helped with this. They either do a forced dorsiflexion which doesn’t really help with the stiffness. I would do this exercise everyday, but I don’t want to push it. Strangely enough my walk speed even increased twice over. 12-13 weeks in is probably a good time to get more aggressive with DF stretching. Hard to say if it’s locked joints or scar tissue or something else, but retaining DF ROM is important, though it can presumably do serious harm if done too much too soon. Chris I have been having that pinching issue too. It really reared it’s ugly head at PT yesterday. My PT was trying to stretch the achilles and calf, but could not move my foot to dorsiflex enough. She did some manual manipulation by pulling my foot and moving it around in the socket. After a small crack I had full range of motion. She said there are a ton of little joints that can basically freeze up because you haven’t used it and it can cause pinching. Literally immediately after I felt that little crack my foot freed right up. I was able to stand on one leg and actually get my heel off the ground, and she was able to stretch the heck out of my calf. It felt so good. I am now able to do some light wall stretches with no pain. I could not do that on Sunday. Idk, I have problems when I do the towel stretch. But the wall has made it like night and day with how my foot feels. No painful tension when i simply dorsiflexion allows me to walk more and at a longer stride. Well I was having an intense pain when I dorsiflexion my foot, but after this stretch the entire day I had no problem or pain. Have you ever had a pinch nerve react when you dorsiflexion or had that issue. Is hard not to think of every twinge as the beginning of rerupture. I do it too. Part of the recovery road I suppose, doubting and worrying. Glad all is ok.take care. I agree, with mags11, that hopefully it is just your scar tissue.. but I would have it checked just in case… to all of you: please be careful also with your PT… I was told that my Achilles was overstretched the first time… take it slow and easy!! If it occurred doing nothing it seems like it would just be scar tissue breaking up, seems weird that your tendon would be weak enough to just tear on its own (and not have had something else tear it). The pt will be able to tell how things are. Best of luck! Good luck to you on this. Hopefully we’ll hear tomorrow that all is well and you’ll continue on the road to recovery. Wishing you the best results. Hi Chris 89. Wishing you good luck and hopefully the crack noises turn out to be nothing. Your PT should be able to help you decide what you should do. Best of luck! Well the pain is only after doing a lot of walking or doing heel raises and basically after I put a lot of workout into the foot. The pain is there but gone once I flex it. I was told that is just because my tendon is a lot thicker and hard to flex, but we will see. I started fwb a little later than you, so that may or may not have something to do with it. I have tightness all around my ankle after (and really during) my pt exercises which I think is to be expected. I figure it is due to swelling and just being in a boot for awhile. I’ve never had pain when I’ve pointed my foot down which I do a fair amount. But you are a few weeks ahead of me so that could be the reason. I see, trust me. I push myself, but when I feel like I can no longer do it I stop. I have had a couple things in therapy I would not do for the requested time. Weighted squats being one of them and standing on a slanted slope stretching the tendon for 20 mins I did for 5 mins that was a little to rough for my tendon at this point. And assisted toe raises were asked to do and I gladly declined. I am not trying to push myself and I even bring my crutches when I go out for a walk. I will be cautious though I am not trying to be set back again. Chris, my blog remembers better than I! It was during my first ATR rehab, a long time ago. First day I could walk perfectly barefoot, my young PT literally paraded me barefoot the length and breadth of the university sports-med clinic! The geezer was the star of the show, recovering from his ATR faster than the undergrads on the varsity teams! I wasn’t smart enough to refuse again, so I grunted out a few. The pain didn’t start for a few hours, but it lasted a month, back in the boot, before I could walk perfectly barefoot again. Don’t Go There! In general, I recommend avoiding anything that causes pain. Obviously short-term transient pain is probably less serious than chronic pain, but I think I’d back off enough to avoid all pain. You want to keep advancing at a good rate (comparable to the most successful protocols/studies), but keeping everything incremental. Pretty soon, your main overdoing risk will be a serious setback but not rerupture. Still worth avoiding. I had a month-long painful setback, too late for a rerupture but still a major PITAnkle! 8 months of it though. I cringe after finishing an exercise with my legs because it hurts to move it around after that. So I shun to think where I will be at by the end of the year. I had loads of pain in my tendon for ages. Took about 8 months to go. I think being too aggressive with the stretching did not help. I did have a month off all PT at about 6 months as it was so sore. Just active walking only. Never thought it would improve but all good now at just over a year. Thinking about going back to squash! I would assume as much, but the tendon is sensitive to the touch for a while after and it stays throughout the day. I elevate, but don’t ice. I guess I might have to add ice, and I was doing the front part of my foot not my heel. Yeah the tendon feels intact, but tenderness persists and is only relieved when I touch it. I will try icing it now and practicing range of motion. If I can work something out on the bike I would enjoy that, since I don’t like going outside with this injury. Too many stares wondering why I am walking so slow. Hahha thanks Norm and Dk I guess I will update if anything changes between now and tomorrow. I am experiencing a bit of the same thing while using the stationary bike. It’s just swelling in the foot and around the tendon. You would know if you did damage to the tendon. As soon as you are done exercising, ice and elevate. The swelling will go subside very quickly, and you will gain back your ROM. Think about the bike riding motion. Your are basically pumping blood into your feet. My PT told me once I am done on the bike elevate above the heart and ice. Then do ROM exercises after icing while keeping the foot above the heart. This will allow you to do full ROM without the swelling. Then ice again after completing ROM. Stay positive Chris you are doing well. I like reading your posts, because it seems we are at about the same place in recovery. But the easiest way to control the AT-challenge level from bicycling is to control your foot position on the pedal. Heel on the pedal =~ 0 challenge. Toe on the pedal +~ maximum challenge. In-between = in-between. In the spirit of INCREMENTALISM, start with your heel on the pedal, and only gradually shift away from there. I just spent a week on a cruise ship to Bermuda and got a lot of practice walking! I still have a limp but if I walk slowly, it’s barely noticeable (can walk barefoot now too but I don’t like it). However, it is very inconvenient to walk at such an incredibly slow pace. For me, going up the stairs isn’t a problem at all - never even had an issue with it. However, going down is very scary. I do what Norm has repeatedly posted on this blog (thank you so much for posting the tip over and over, Norm) and that is walking down with my bad leg over the edge of the step and roll over it. No pressure or stretch on my Achilles and I don’t look like a total invalid going down one step at a time. Congrats on no limp Chris!! That is awesome. I walked today for about a mile without the boot. I was most definitely limping. Especially toward the end. Great advice on the whole stair issue. It really helped me out. Thanks for the comments. I figured that I would need more calf strength, which I have very little of at the moment. I am thinking of practicing seated calf raises with a ten pound weight to get started, at physical therapy they make me do heel raises while grabbing something. And it is kind of scary when I heard of people rupturing by doing such. I will do what I need, because right now I can’t even walk to the corner store unless I bring my crutches to go up and down my steps outside my house. I would love to be able to just go. Again thanks. The main variable that controls the AT-friendliness of stairs is how much of your foot is on the step and how much is hanging off. Ironically, that variable works differently when going up and going down: Going up, you can take the load off the AT by putting your whole foot on the step. Going down, you can avoid overloading your AT by letting the front of your foot hang out over air, and letting it roll around the step as you step onto the other foot one step lower. That latter technique can avoid the most common work-around on steps, going downstairs asymmetrically, always leading with the injured foot. With this “trick”, you can walk down symmetrically, at normal speed, without stressing your weak and inflexible leg. Good news on working out the limp. I’m behind you a bit so I don’t have answers for getting up stairs yet. I hope to practice at my mom’s this weekend as she lives in a split level so there’s always a few stairs to navigate. Just keep up the good work and before you know it you’ll have the strength you’re looking for. Though I am sure someone else will have better advice. No advice I’m afraid, just sympathy and wishes for speedy recovery from your set back. Sounds painful. Hope someone can give some feedback on their experience. Good luck and take care. My big toe was stiff and jammed up for a while after I went into two shoes, too. There was pain when I tried to curl it and it felt like the knuckle/joint needed to “pop.” It eventually worked itself out after a week or two without any kind of PT or stretching, so I wouldn’t worry about it. I pick up marbles with my foot, I didn’t get a toe graft, Just very hard to flex my big toe. When i flex it with my hand it hurts. Yeah, when I see my pt this Monday I will ask about it, but I am scared hahaha that they will go overboard on the pt. chris89’s AchillesBlog is proudly powered by WordPress and WPDesigner..